Art Talk: Celebrate Good Times! Okay, the major stress is over! School is out for the year... can you believe it???? I certainly was ready except that I didn't get my room all in order yet. Still gotta go back in to do that but other than than, we are officially on a more relaxed schedule! Mornings will not be rushed and afternoon naps may be reinstated! Lots of swimming and playing is mandatory!!!! Maybe even some laziness mixed in (well, as much as can be allowed with 2 little kids running around!). I might get some scrapping and artwork done this summer as well... maybe. Why don't toddlers understand the need to go play in a safe and quiet manner for more than 2 seconds! Isn't that sweet??? LOVE the colors and that circle die as totally adorable!!! So can you see why I'm excited?? I have seen a few other of her new lines and can tell you that they are even cuter and more versatile, if that's possible!! I'm working on more new things with Nikki's papers too and maybe even combine Nikki and Couture Cardstock for a fun layout or two!! Here are a few newish Couture Cardstock pages that I can post now. I love the neutral color of the Confectionary line so I decided to use die cuts and punches of leaves and add some textures mixed with some patterned papers for a "fallen leaves on the ground" look. Supplies: Nougat, Hot Chocolate, Hazelnut, Fudge, Bon bon, Fondue, and Caramel cardstock. Cosmo Cricket Joyride papers. EK, Martha Stewart and Fiskars punches. 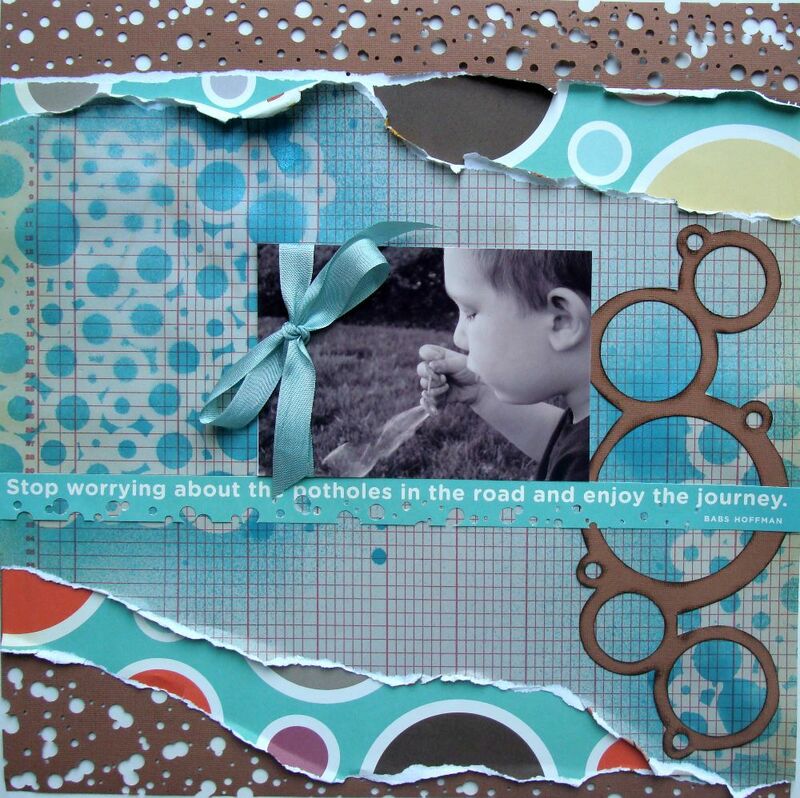 Cuttlebug dies and texture folders. Cosmo Cricket chipboard button letters. Martha Stewart ribbon. Glimmer Mist (Tattered Leather and Coffee Shop). This is quite linear for me, but I wanted to use multiple photos and thought I'd keep it simple. Cosmo Cricket Joyride, Canvas cardstock, Cosmo Cricket button letter, Adirondack paint, American Crafts ribbon. 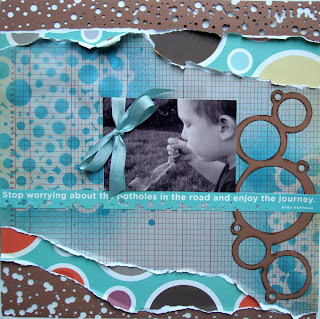 I used punches to make the borders that layered with patterned paper from the Cosmo Cricket Joy Ride line. Kind of a play off my "Layers" page from last month but more linear. OMG.. did I have fun with this one! 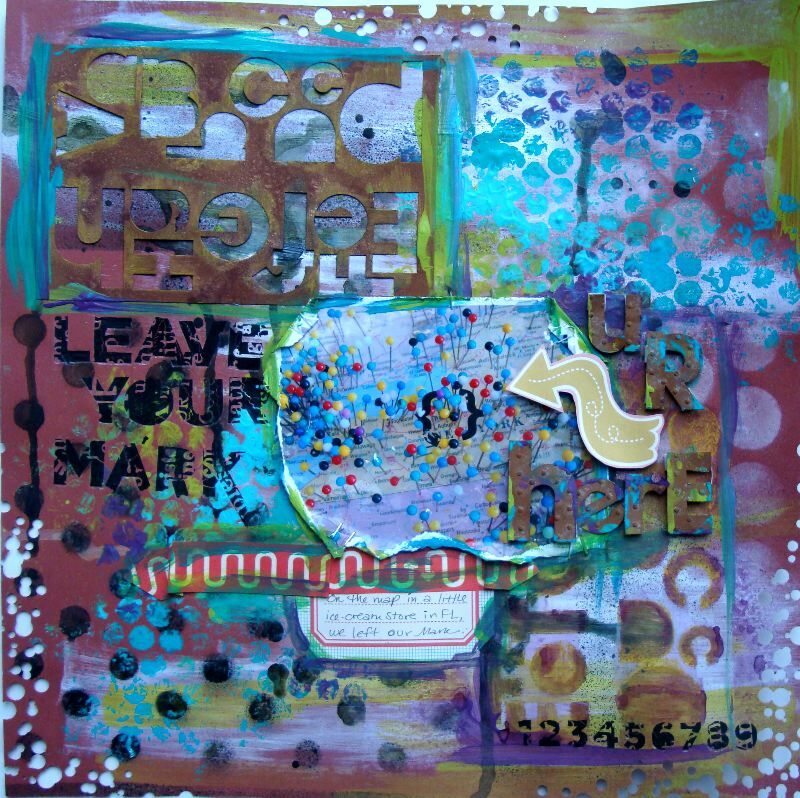 I started with Fondue paper and added paints, glimmer mists, more paint, more glimmer mist, die cut remnants, and a multitude of other things to this artwork. The photo is from a big map in an ice cream parlour in Anna Maria Island, FL... where everyone that visits leaves their map pin in their hometown! So colorful and fun! 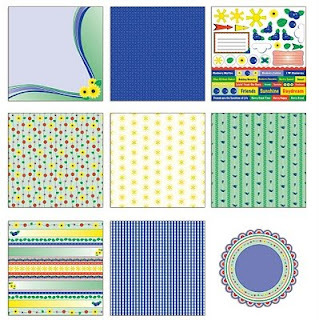 Supplies: Fondue cardstock, paints (FolkArt, Adirondack, Golden), Glimmer Mist (Marshmellow, Cinder, Pashmina, Lime), Cuttle bug die cut letters and texture folder in dots, bubblewrap, punches (EK, Fiskars, and hole punch), Tiny Attacher. That's it for now! Off to lay by the pool... okay, maybe not lay... I'll be chasing a one year old around! BUT there is always nap time!!!! Congrats on the Nikki Sivils gig! Again! Muah! Enjoy your summer chica! These are all wonderful, Jen! Love the bubbles one, and "Remnants of Fall" is such a cool litle! Love all the leaves and textures! And yes, congrats on Nikki Sivils for the 2nd year! Awesome! How did you do those cards? They are all amazing. I wish you can teach on how to make that kind of crafty work.